Guard Ayrik Miranda pushing the tempo after a Saint’s turnover. The 2-1 Heritage Hawks hosted the 1-2 Orcas Christian Saints on December 16, 2014. 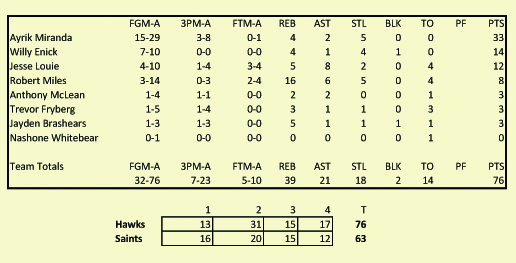 The Hawks were looking to rebound from their first loss of the season, falling to Lummi Nation 55-79. Senior guard Ayrik Miranda was making his home debut vs the Saints and inserted into the starting lineup. The 1st quarter got off to a rocky start as the Hawks failed to connect on their first four shots, while the Saints started off 3-3 from the field to take an early 7-0 lead. Two minutes into the opening quarter Center Robert Miles was fouled while shooting and subsequently made a free throw to put the Hawks on the board, 1-7. The Saints responded by converting two free throws of their own to take a 9-1 lead. That would be the largest lead of the game by the Saints as the Hawks got their offense going. The Hawks spread the floor offensively and focused on moving the ball from player to player. Over the next 3:00 of game play the Hawks stellar ball movement resulted in an 8-0 run to tie the game at 9-9. The Saints responded with a 7-0 run of their own, taking advantage of offensive rebounds on four straight possessions, to take a 16-9 lead. In the Hawks closed the quarter on a 4-0, scoring two straight transition buckets. At the end of 1 the Hawks trailed 13-16. The Hawks carried their momentum into the 2nd quarter by scoring two quick buckets to take their first lead of the game, 17-16. Making his home debut in fashion, Ayrik was in the midst of scoring 10 straight Hawk points. Both teams traded baskets until the Hawks called a timeout with 5:16 remaining in the half, with the Hawks trailing 24-25. Ayrik and Trevor Fryberg hit back-to-back 3-pointers and Willy Enick hit an elbow jumper to put the Hawks up 31-29, leading to a Saints’ timeout. Following the timeout Aryik hit another 3-pointer to give the Hawks their largest lead of the game, 34-29. To this point Ayrik was on fire having scored 14 points in the quarter and 18 of the last 25 points scored by the Hawks. The initial defense of Hawks was forcing the Saints to take contested jumpers, but because the Hawks weren’t boxing out the Saints’ bigs were getting easy putback baskets. The offense continued to flow regardless, and Jesse Louie found his range hitting a 3-pointer and Willy Enick hit an elbow jumper to extend the Hawks lead to 44-36 at halftime. Coach Cyrus “Bubba” Fryberg used the halftime intermission to motivate his Hawk players to improve their defense play. “Defensively we are being outhustled. They have gotten way too many rebounds and they are scrapping to go get the ball. Why? Because we are playing lazy. We have to play harder, box out more, and hustle after the ball,” Fryberg told his players. With the defensive intensity turned up, the Hawks came up with two steals during a 7-0 run to open the 2nd half to push their lead to 51-36. Both teams would alternate scoring baskets over the next several minutes, all the while the Hawks maintaining a double digit lead. That is until they committed four turnovers in the final 1:30 of the 3rd quarter. The turnovers proved costly as the Saints converted them into buckets, closing the quarter on a 6-2 run. Going into the final quarter the Hawks lead was down to 8 points, 59-51. The Hawks began the 4th quarter with the same defensive mindset their coach instilled in them at halftime. They forced six straight Saints turnovers to hold the Saints scoreless three minutes into the final quarter. Capitalizing on their defense and getting timely offensive rebounds and putback layups by Enick the Hawks were on a 6-0 that pushed their lead to 65-51 with 5:06 left to play. Seeing enough of his team committing turnovers the Saints coach called a timeout to have his team regroup. Following the timeout the Saints put their offense in the hands of their point guard Michael Harris. He drove to the basket aggressively on the next six Saints possessions, scoring two buckets and coming away with four made free throws. On the other end, the Hawks continued to move the ball well and were scoring at the rim. With 3:00 to go the Hawks led 70-59. Saints’ Michael Harris again drove to the rim scoring another bucket; he had scored the last 10 Saints’ points. The Hawks continued to score off their offense sets and adjusted defensively by packing the paint to stop the Saints’ point guard from driving to the hoop. When the game was over the Hawks were now 4-1 on the season as they beat the Saints 76-63. 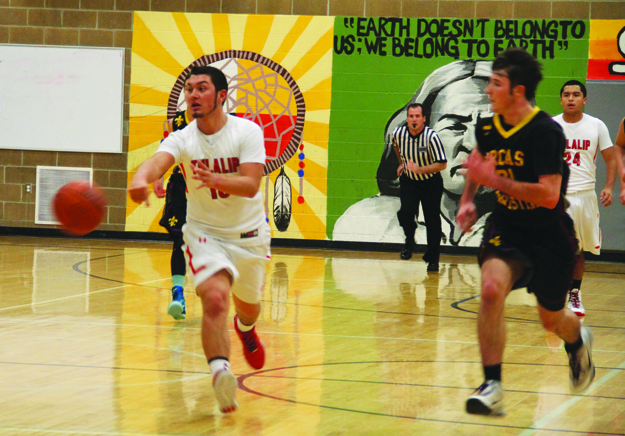 This entry was posted in Sports, Tulalip News and tagged Basketball, Heritage Hawks, Orcas Christian Saints, Tulalip by Kim Kalliber. Bookmark the permalink.